← Sunshine: Could you survive a vacuum…? Just what you’ve always wanted! A nice big caffeine molecule to cuddle to sleep. Or… cuddle into wakefulness? 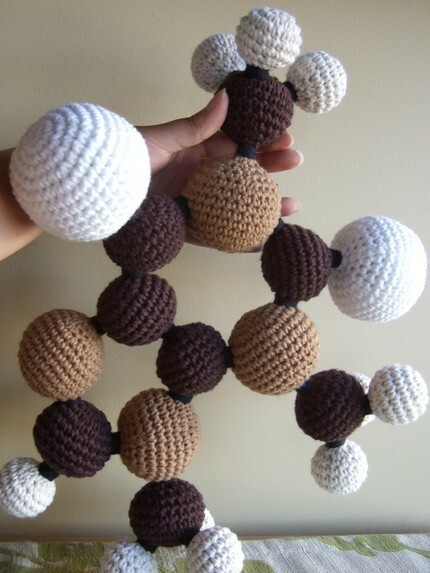 Even if you’re a person sensitive to caffeine, there are a host of lovely crocheted molecules for sale at the Prim and Plush Etsy shop, including nucleobases, cycloalkanes and several cute little methane molecules. This entry was posted in Imported from Livejournal and tagged culture, molecules. Bookmark the permalink.